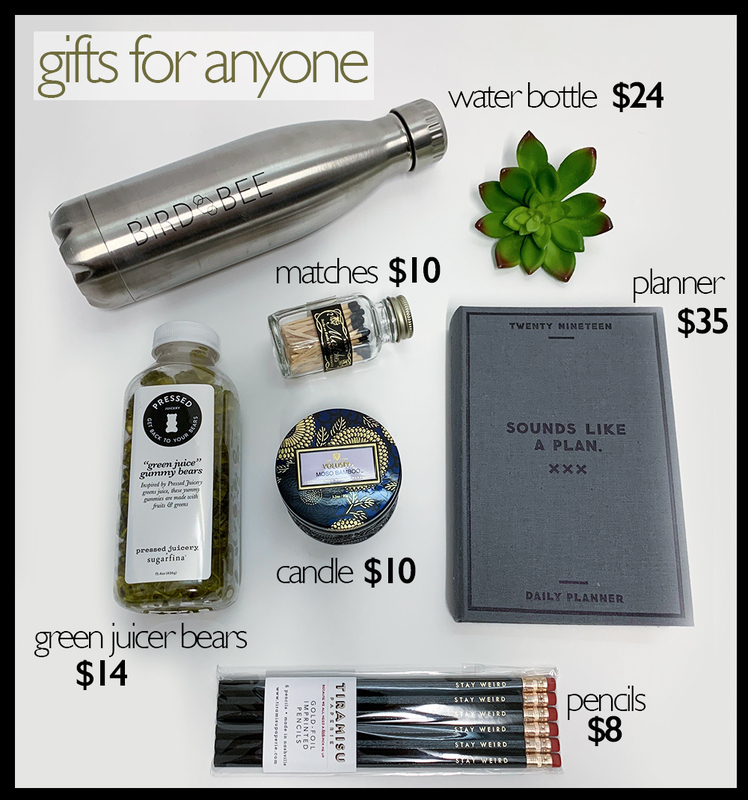 Bird Bee Blog: HOLIDAY GIFT GUIDE: For the: Jetsetter, Cocktail Lover, Beauty Queen + Everyone Else! 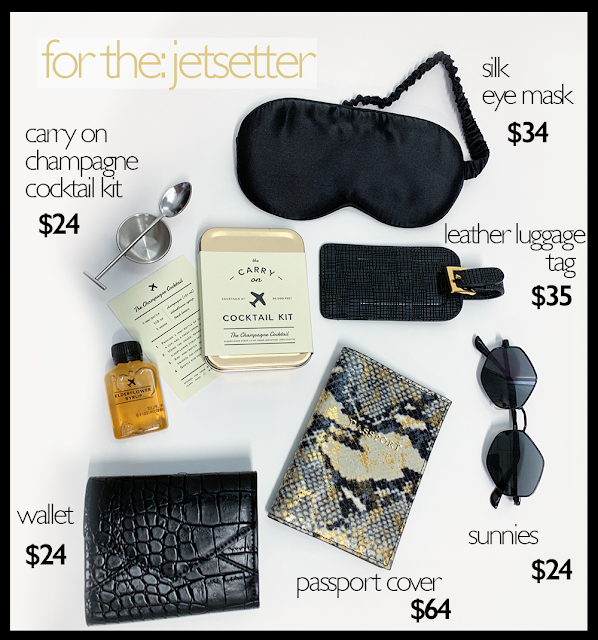 HOLIDAY GIFT GUIDE: For the: Jetsetter, Cocktail Lover, Beauty Queen + Everyone Else! Great drinks taste better when they look cute ;) We've got all the cutest cocktail and wine accessories in the store that will make perfect gifts for that person who loves to host parties, or maybe for your friend who just got a new home! 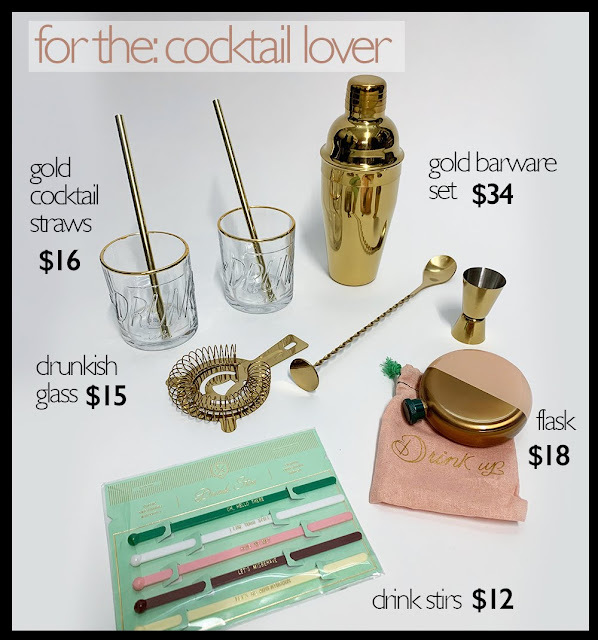 The bright gold barware set comes with a shaker, a spoon, a jigger and a strainer, cute enough to display on any bar cart! Add these drink stirs to any drink for some added fun flair. We also have gold straws to use over and over again now because who uses plastic? Lastly, everyone needs a cute little flask and this round stainless steel flask comes with a "drink up" fun canvas bag. Cheers!! Your friend with the flawless skin? She's going to love our Lapcos facial masks that work for any skin type, and for only $4, might as well grab one for yourself! Lately, we've been obsessing over the new Kitsch makeup removing towels- all you need is water to take off even the most stubborn of makeup. Next up, and ALL THE RAGE right now: facial rollers! This gemstone roller is used as a gentle way to massage tension and relieve stress from our facial area, help in reducing fine lines, assist with better circulation, and help massage in facial products or essential oils. 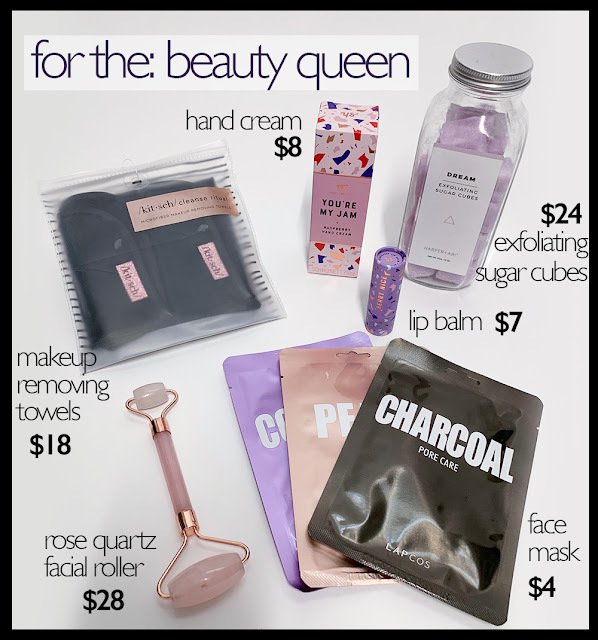 They are a must have for all beauty gurus! The sugar exfoliating cubes are easy to use on the body in the shower for some extra skin pampering. We've also got lip balm and hand cream - something that any girl cannot get enough of, not to mention a perfect stocking stuffer! Sometimes you just don't know what to get someone! Don't worry we have options! The Bird Bee insulated water bottle keeps your drinks ice cold or super hot! Like, seriously, fill this thing up with coffee and it stays hot for HOURS...no joke. Next up, our usual go-to EASY and FOR ANYBODY recommendation would be a a mini voluspa candle and mini match bottle. Who doesn't love candles? Then, we have one of our favorite minimalist planners for 2019 complete with sassy fun quotes on the inside. For those babes who maybe just aren't so organized, we have tons of other notebook and stationary options to complement these cute as heck pencils in-store! Lastly, everyone loves gummy bears! Inspired by Pressed Juicery's green juice, these bears have no artificial colors or flavors, are fat free, and non-GMO. Even better? Each serving contains 20% of your daily Vitamins C & A. They're cute, delicious and kinda healthy! Score.